Veteran UFC Heavyweight fighters Mark Hunt and Oleksiy Oliynyk headlined tonight's UFC Fight Night 136 event in Moscow, Russia and by the end of the evening it was the latter who eventually came out on top via a first round submission victory. Heading into this fight, UFC Heavyweight veteran Mark Hunt was coming off a devastating loss to Heavyweight superstar Curtis Blaydes at UFC 221. Despite gaining control of the fight in the early stages, Hunt eventually lost the bout via unanimous decision after he got outwrestled by Blaydes in the following two rounds. However, prior to his loss to Blaydes, Hunt had previously scored an impressive TKO win over Derrick Lewis at UFC Fight Night 110. 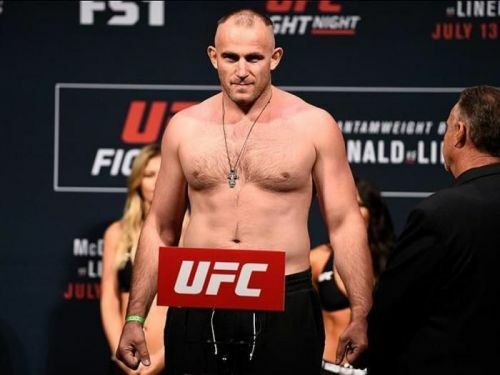 Meanwhile, on the other hand, Hunt's opponent Oleksiy Oliynyk came into this fight having scored an outstanding submission win over Junior Albini at UFC 224 via the first ever Ezekiel Choke in the UFC. Following an entire evening of outstanding UFC action, we were finally down to our main event of the evening, as Mark Hunt and Oleksiy Oliynyk battled each other to an absolutely amazing fight in front of thousands of people in the Olympic Stadium. As round one began, it was Oliynyk who quickly started-off the fight with some outstanding pair of jabs, but Hunt quickly got in control of the fight, firing off a low-kick which was then followed up by a brutal jab. Hunt then managed to connect with another wicked punch and a low-kick that eventually turned Oliynyk's leg bright red on the outside. By this point, the Russian was pretty much was struggling to stay on his two feet, but somehow managed to catch The Super Samoan with a left hook and subsequently stun him. Oliynyk finally finds an opening and then scores a huge takedown and almost immediately locks in the rear-naked choke on Hunt, as the Aussie is forced to tapout, leading to a huge win for Oliynyk. Following Oliynyk's win over Mark Hunt, the former apparently stated that he'd like to face-off against anyone in the Heavyweight division who is apparently not ranked lower than the Russian.